Most often, giant left ventricle mass are thought to be tumor, rarely thrombus (1). Usually, thrombus is unique, and located in the aneurismal segments of left ventricle (2). We present a case of an impressive mass, surrounding all left ventricular walls, complicated with a fatal embolic stroke, as a fi rst clinical manifestation of a giant cardiac thrombus in a patient undiagnosed before with cardiomyopathy. A 48-year-old man, with no important medical history was admitted in intensive care unit with acute cardiac failure. Clinical examination revealed a heart rate of 120 bpm, blood pressure of 110/60 mmHg and a temperature of 37.3°C and bilateral pulmonary wet rales. Biology found an infl ammatory syndrome and increased NT-proBNP level. Electrocardiogram showed sinus tachycardia, without signs of acute ischemia. Two-dimensional echocardiography performed at admission visualized a dilated left ventricle (LV), diffuse hypokinesis, without LV wall aneurysm, severe depressed left ventricular function with ejection fraction of 15%, and a giant mass, adherent to the internal surface of the LV, with protrusive, highly mobile segments into the cavity (Figure 1A). Both 3D echo (Figure 1B) and CT scan confirmed the mass, raising the hypothesis of a massive cardiac tumor. Shortly aft er admission, the patient developed right hemiparesis, due to an acute embolic event in the middle cerebral artery territory with rapid deterioration and he died 2 hours later. 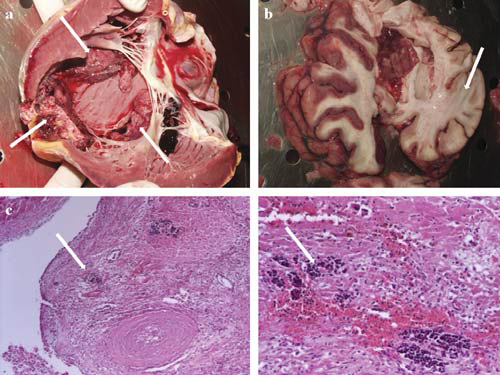 A necropsy was performed, and macroscopic examination revealed an impressive mass surrounding all LV walls, penetrating the endocardium and partially the muscular layers, compatible with tumor, and a massive ischemia of the left cerebral hemisphere (Figure 2A). Surprisingly, histological examination demonstrated a giant thrombus, with different ages: a part of an organized thrombus contained an inflammatory cell infiltrate composed of a mixture of granulocytes and mononuclear inflammatory cells or predominantly lymphocytes with new blood vessels, and other segment representing by a new, fresh thrombus. All the thrombus was infiltrative and caused myofibrils disarray (Figure 2B). Giant masses in left ventricle (LV) are most often tumors1. Most primary cardiac tumors are originated in left or right atria, only 4% of total cardiac tumors arising from other locations, including LV and may be malignant. In these rare cases, imagistic tools play an essential role. A giant, mobile LV mass, appeared to invade the free wall, located in all internal areas of the LV, including LV outfl ow tract, associated with severe LV dysfunction, has to be firstly consider a cardiac tumor. However, in our case, histology revealed the mass to be an impressive thrombus with different ages as formation and causing myofibrils disarray, probably due to a long process of thrombus formation superimposed with an acute inflammatory process. As known, thrombi usually appear at the LV apex level, most often in the presence of an aneurism (2). Majority of these thrombi are mural and immobile with low risk of embolism (3). Massive, attached of the entire LV internal surface, and mobile thrombi are rare in comparison with mural thrombi, however, they have a significantly higher risk of embolism (4). In present, there are no certain protocols for management of these cases. However, anticoagulant therapy may sometime be useful, but significant embolization during anticoagulant treatment has been reported (5). Moreover, it is known that the outcome of patients with mobile and extensive masses who are not treated surgically is generally poor compared with who undergo surgery (4). Unfortunately, due to a massive cerebral embolization and rapid deterioration of clinical status, our patient could not benefit from surgery, and died 2 hours after admission. Figure 1. 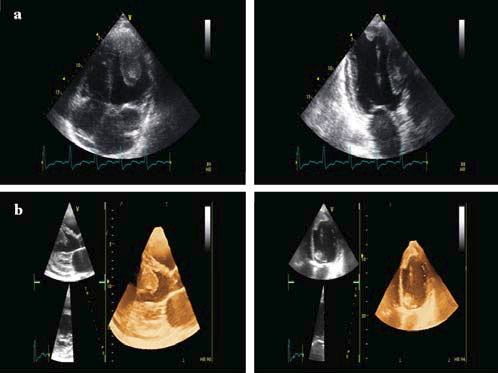 Two-dimensional echocardiography from 4-chamber view and 3-chamber view, showed a giant and protrusive mass, surrounding the left ventricular cavity (A) and 3-D echocardiography confi rmed the presence of a mobile mass, even in the left ventricular ejection tract (B). Figure 2. Macroscopic examination of the heart revealed an adherent giant mass, surrounding all left ventricular cavity, partially penetrating the myocardium (arrows) (A) and examination of the brain showed a massive ischemia in the left cerebral hemisphere (arrow) (B). Hematoxylin-Eosin staining on histological examination and a focused image demonstrated an infiltrative thrombus, with different ages, causing myofi brils disarray (arrows) (C). To our knowledge, this is the first description of a giant mass surrounding entire left ventricle cavity, demonstrated to be a thrombus with different morphologies. Shape, size, mobility, and attachment of the thrombus to the subjacent layers may influence the risk of embolic complications. Clinicians should note the possibility of rapid embolism of massive thrombus and the potential fatal outcome of these patients. Keywords: echocardiography, left ventricular giant mass, thrombus. Keywords: echocardiography, left ventricular giant mass, thrombus. 1. Sezgin A, Akay HT, Korun O, Gultekin B, Bilezikci B. Surgical management of myxoma like sclerotic calcifi ed mass in left ventricle out flow tract. Kosuyolu Heart J 2011;14:26–8. 2. Okuyan E, Okcun B, Dinçkal MH, Mutlu A. Risk factors for development of left ventricular thrombus after first acute anterior myocardial infarction-association with anticardiolipin antibodies. Thromb J 2010;8:15. 3. Bakhtiari RE, Khaledifar A, Kabiri M, Danesh Z. Mobile pedunculated left ventricular masses in a man with recurrent emboli. Heart Views 2012;13:146–8. 4. Bayrak F, Kahveci G, Degertekin M, Mutlu B. Vanishing multiple thrombi in left ventricle of a patient with dilated cardiomyopathy. Int J Cardiol 2009;133:37-38. 5. Akcay M, Senkaya EB, Bilge M, Bozkurt M, Arslantas U, Karakas F. Flying saucer located at the basal septum. Echocardiography 2008; 25:762-3.